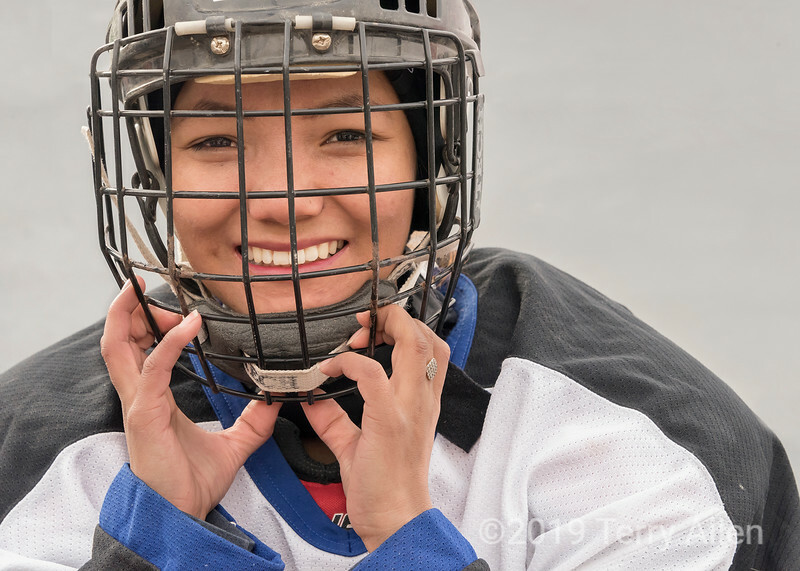 Portrait of a woman hockey player from the Ice Hockey Association of India in a hockey mask, 2018 Ladakh-Delhi championship game, outdoor ice rink, Leh, Ladakh. India is not a nation that I associate with hockey, but I had a surprise opportunity to go to a hockey game played on the Leh town reservoir, which freezes in the winter. The women's gear and some of their coaching was provided by Canada, and the great Canadian hockey player Hayley Wickenheiser (4 Olympic gold medals and 1 silver) visited Leh in January bringing additional bags of gear for the women. Quite an experience to see a lively, enthusiastic women's hockey game played on an outdoor rink in the brisk air at 12,000 ft, beneath the high snow-covered mountains of the Stok range, and overlooked by temples and stupas perched on the town hills! What a lovely smile !! Nearly defies belief, playing a dynamic sport like hockey at 12000 feet !! What a happy and fun shot! The words paradox and juxtaposition come to mind in hearing about all this, and I'm so glad you had the chance to experience this. Sweet. Love this portrait. What a sweet smile. Pretty lady and lovely portrait.